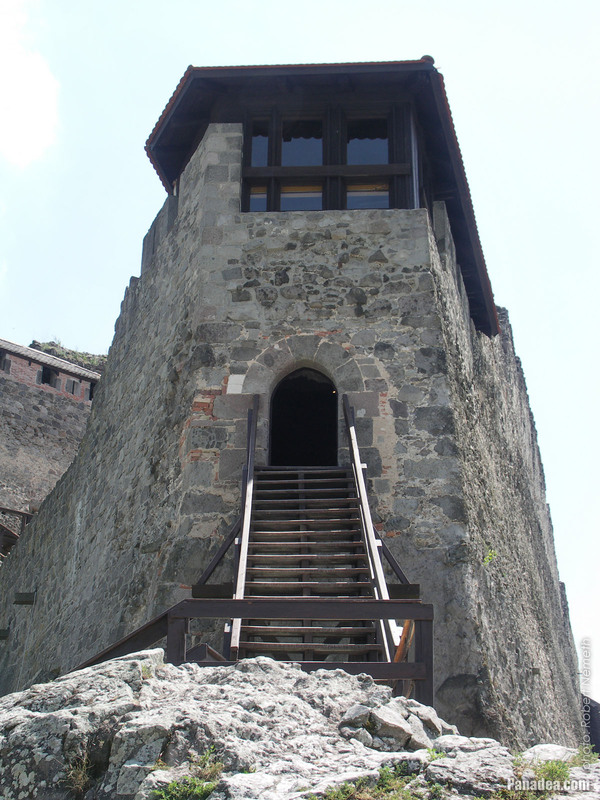 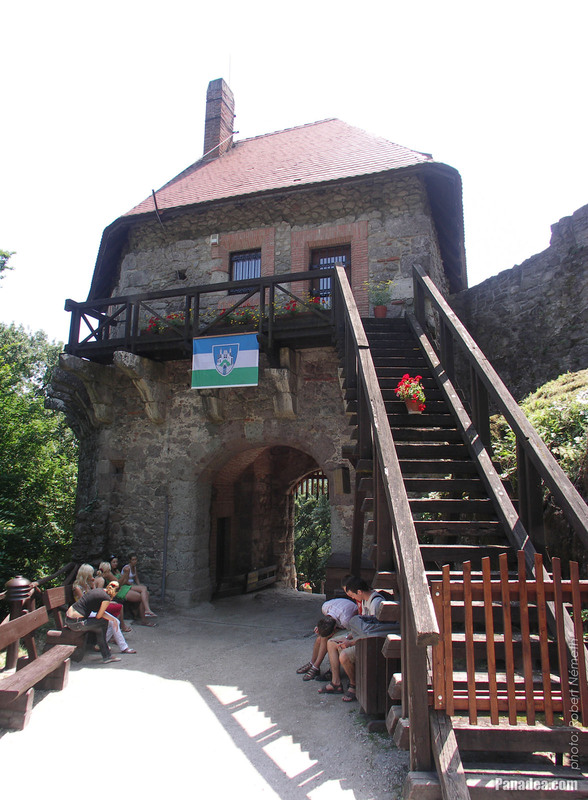 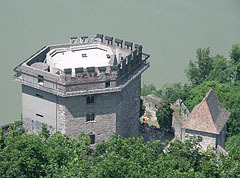 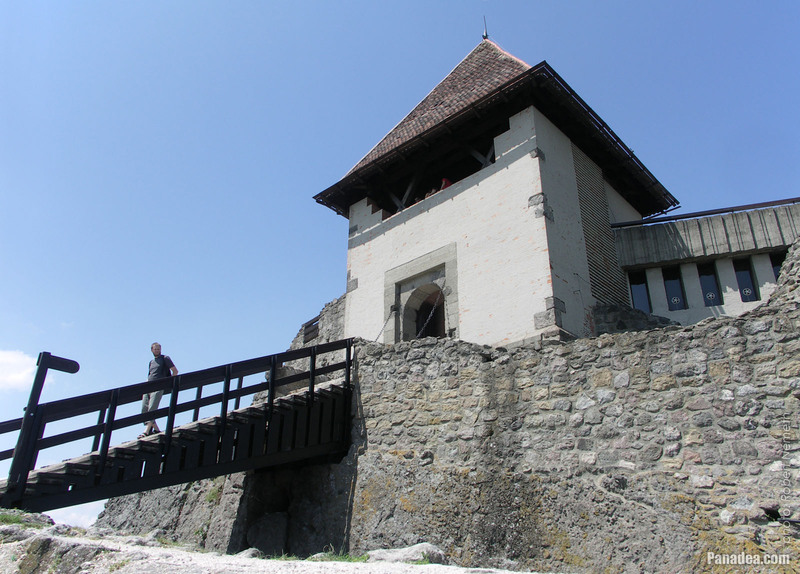 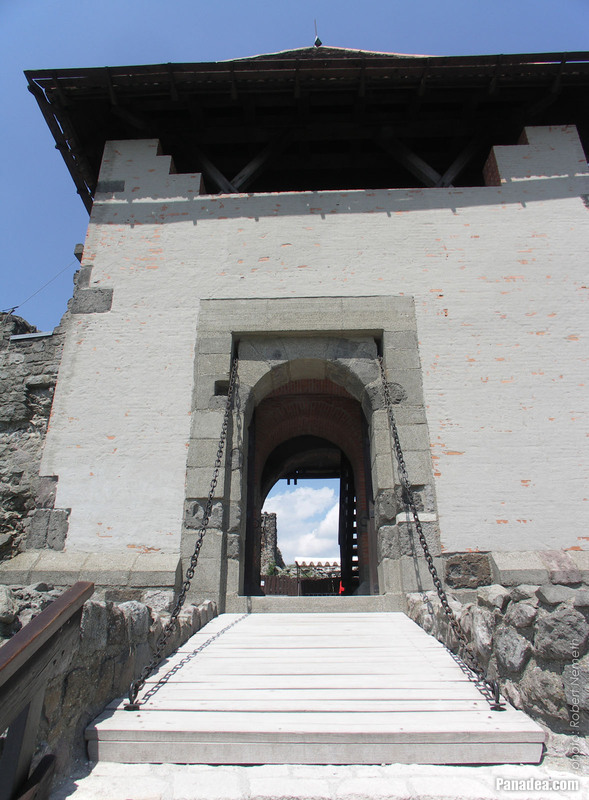 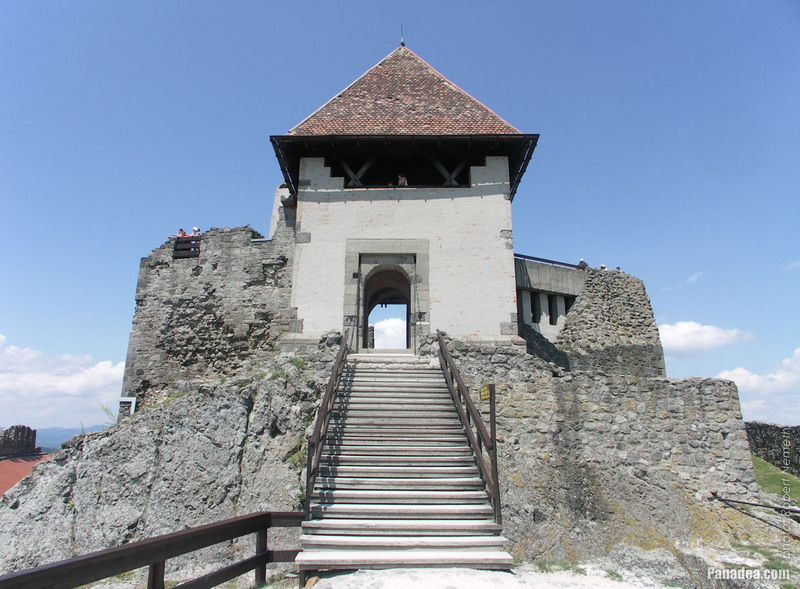 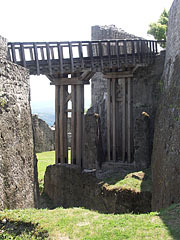 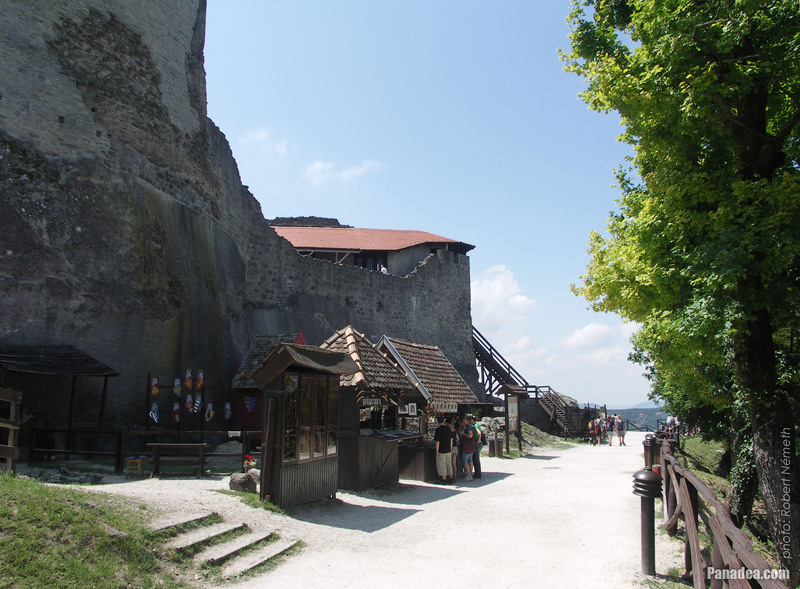 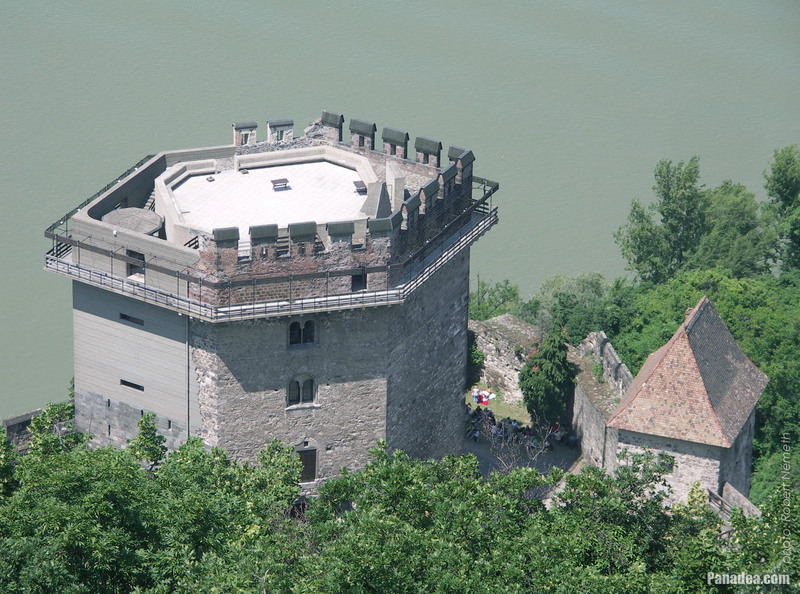 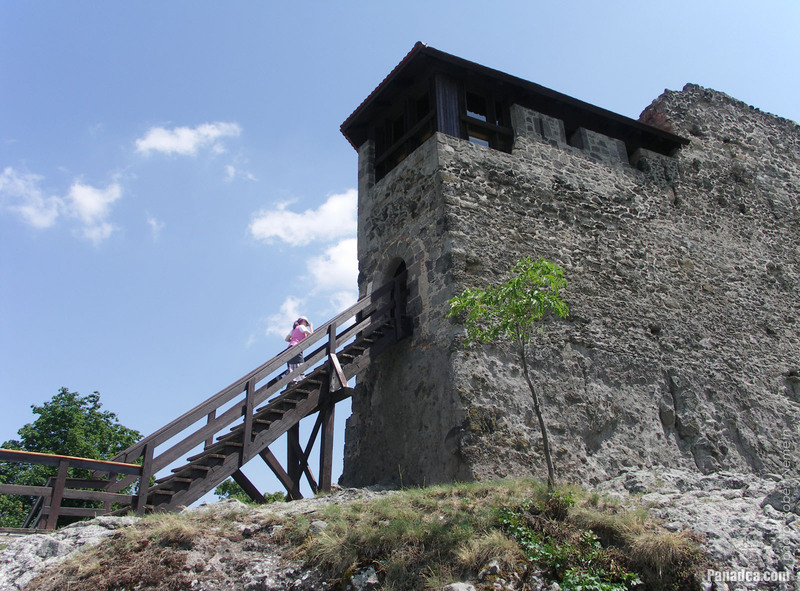 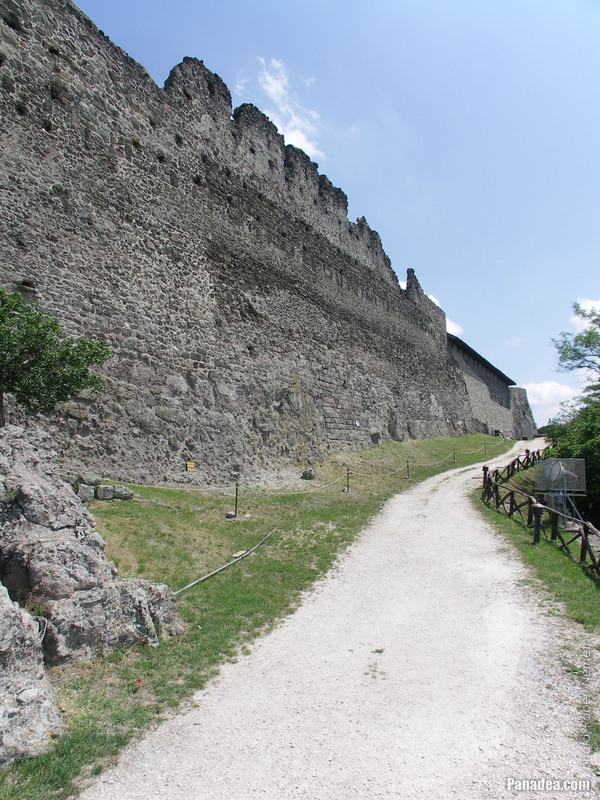 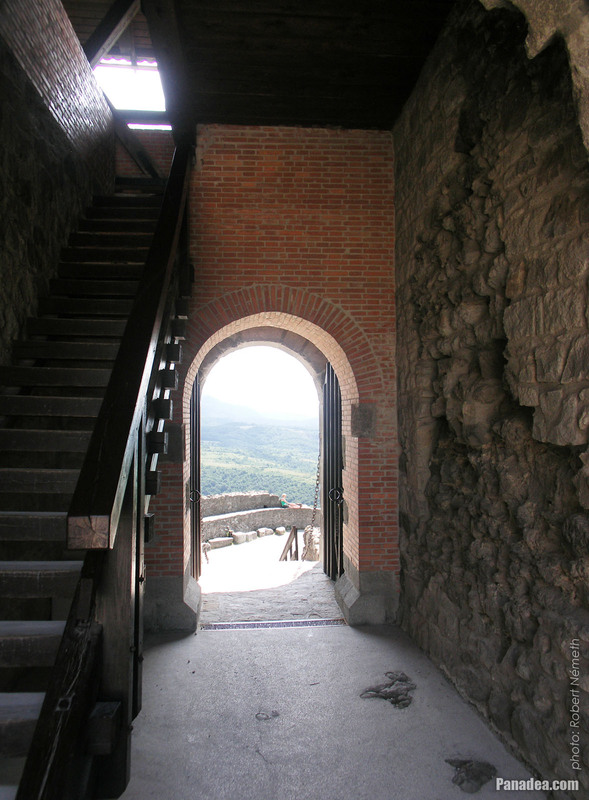 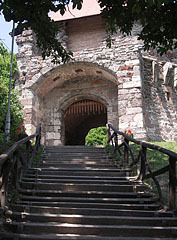 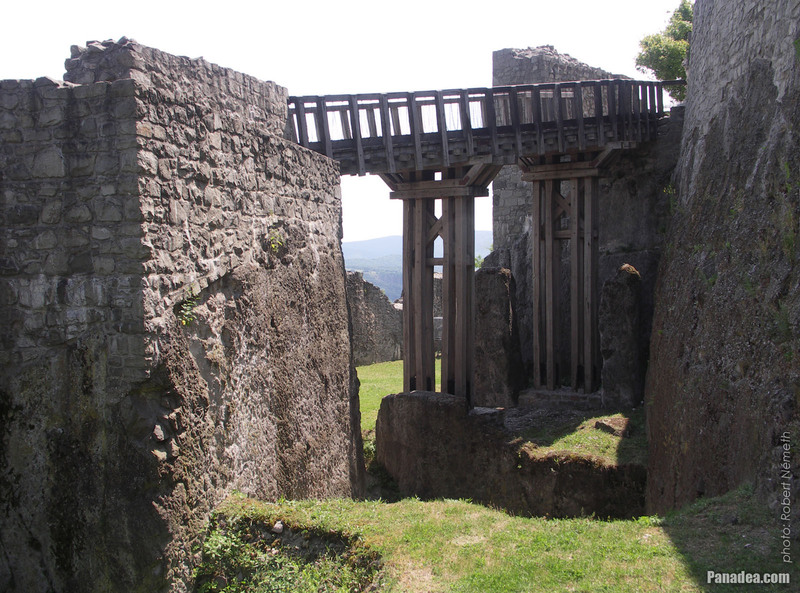 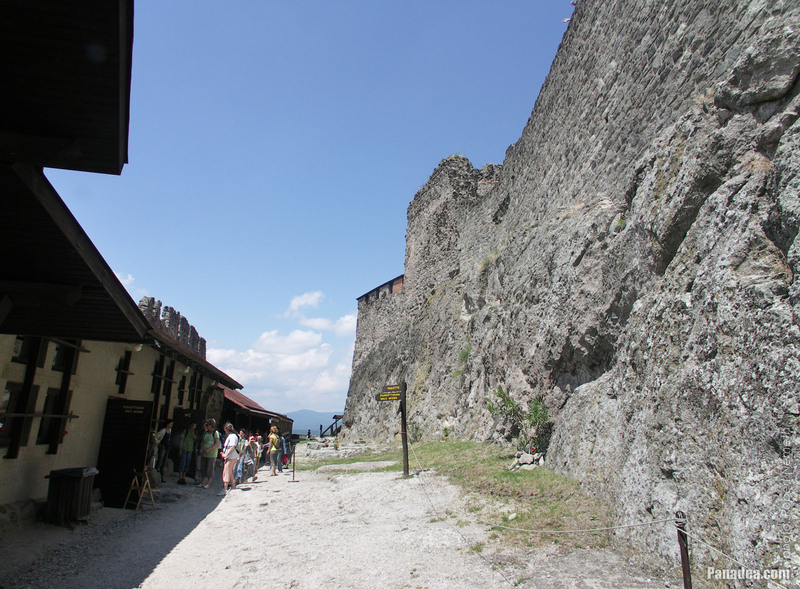 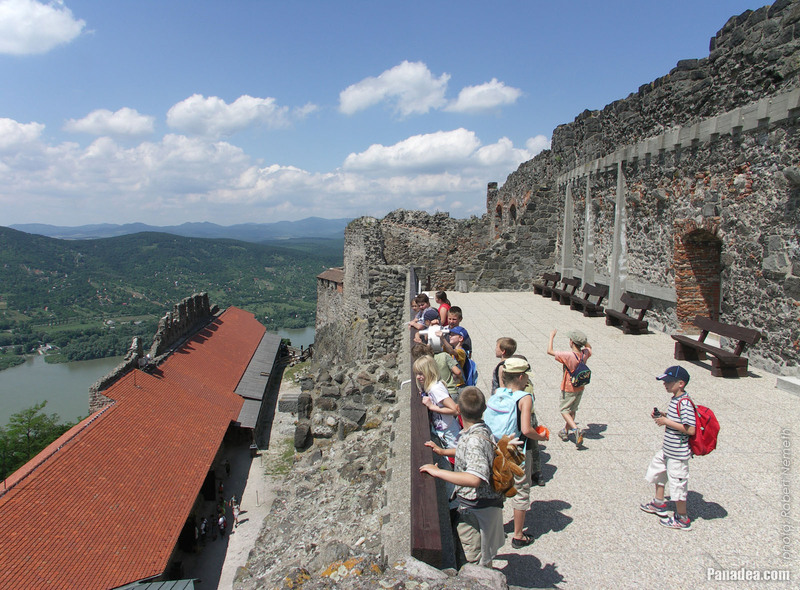 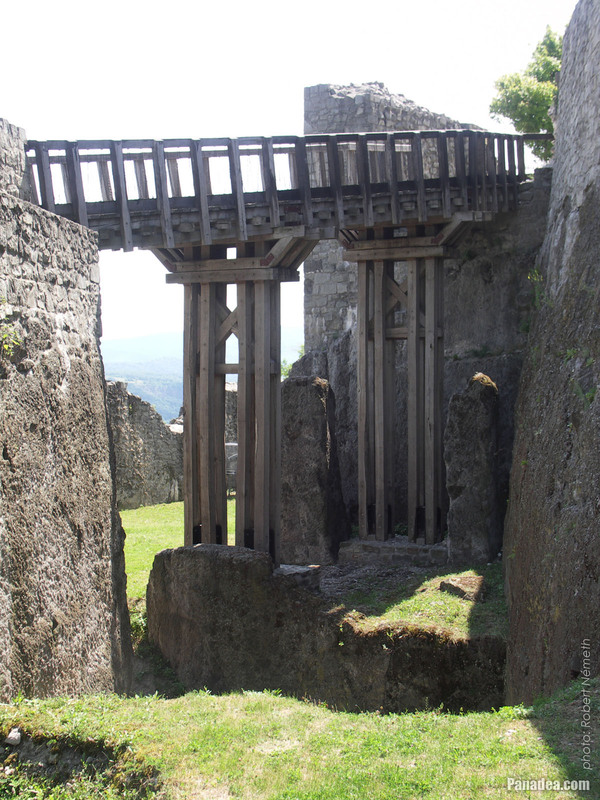 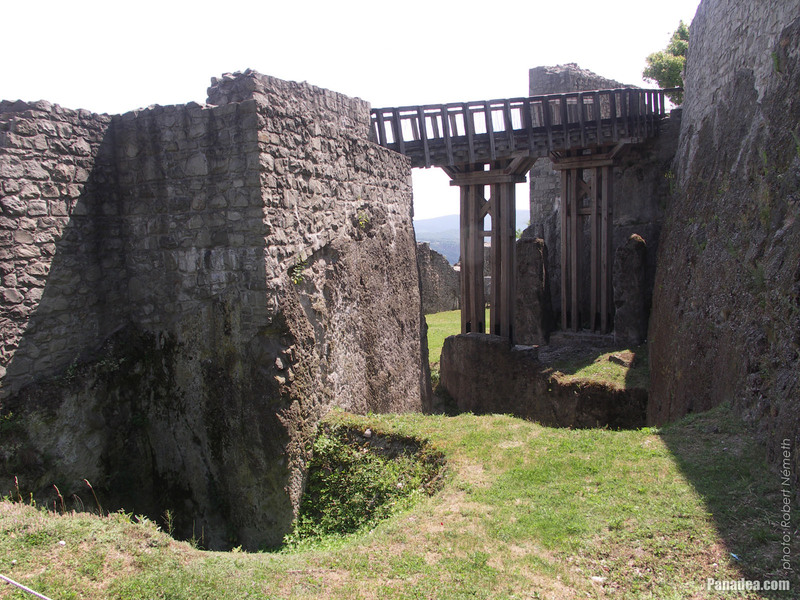 In around 1400 Sigismund of Luxemburg King of Hungary had a third defensive wall built around the Upper Castle of Visegrád, and also ordered to build this gate tower on it. 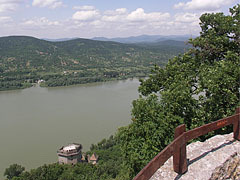 On the upper side of the photo the small islands and peninsulas are remains of the formerly planned Gabčíkovo-Nagymaros Waterworks hydroelectric power plant construction. 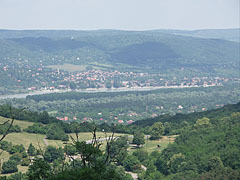 On the Visegrád section of the Danube Bend the traces of the construction of the formerly planned Gabčíkovo-Nagymaros Waterworks (or Bős-Nagymaros hydroelectric power plant) still can be seen. 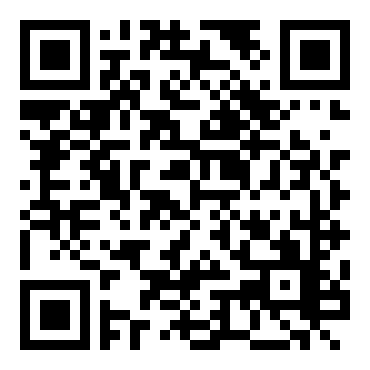 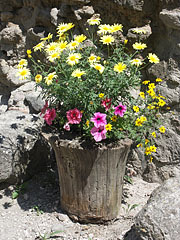 The idea comes from the 1930s, then in 1963 it formed to a concrete investment plan between Hungary and Czechoslovakia. 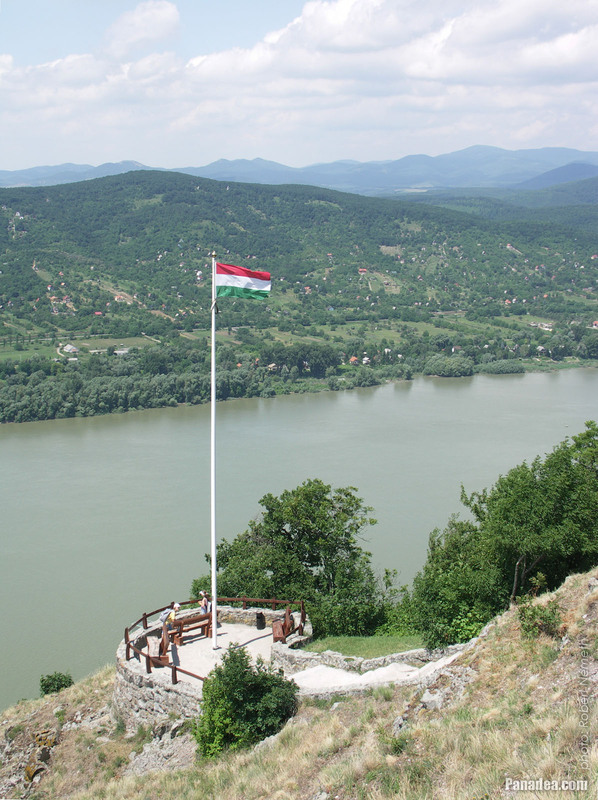 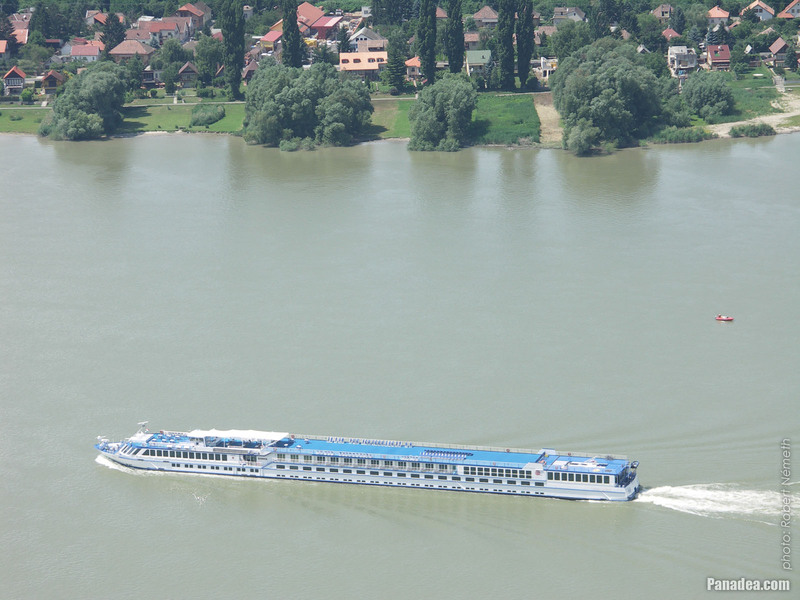 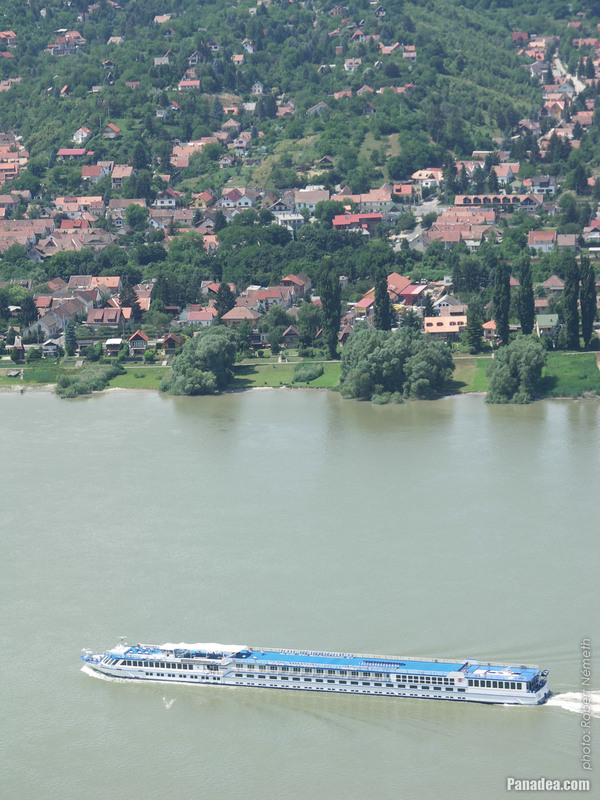 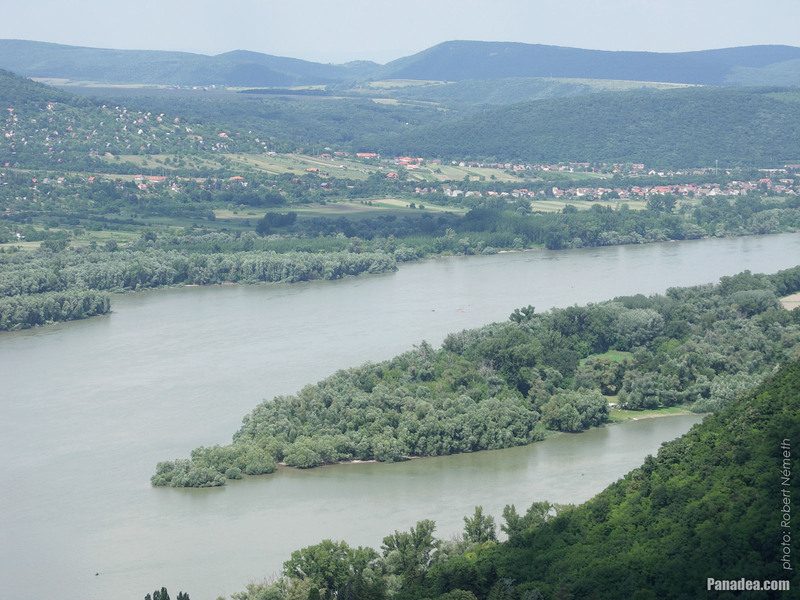 The aim was to improve the navigability of River Danube and to produce energy by building a hydroelectric power plant building complex, among other locations here in the Danube Bend (Hungarian: "Dunakanyar") region. 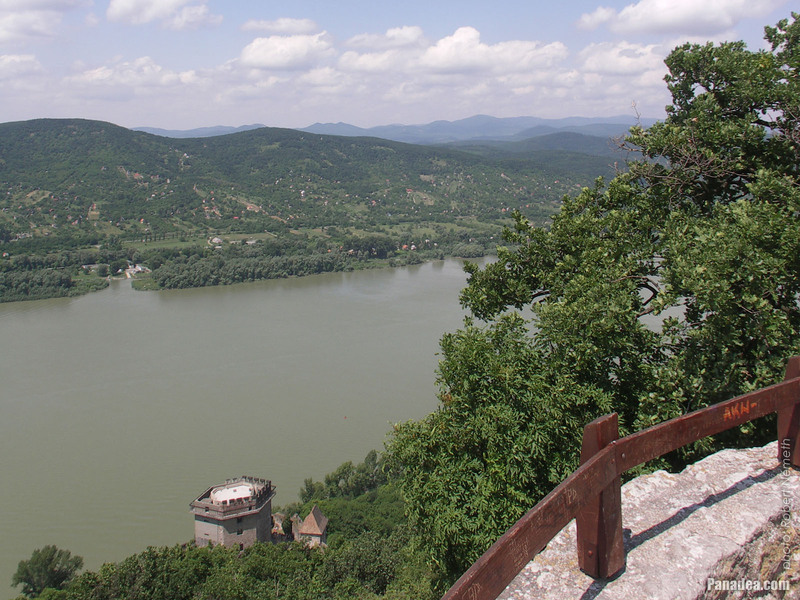 But the planned waterworks wasn't built up, because it was feared that it will cause and ecological disaster on the upper sections of the Danube River, especially in the wet meadows of the Szigetköz island plain in Hungary. Due to this in 1990 at the first National Assembly after the political system change in Hungary the Hungarian parties rejected the construction of the facility. 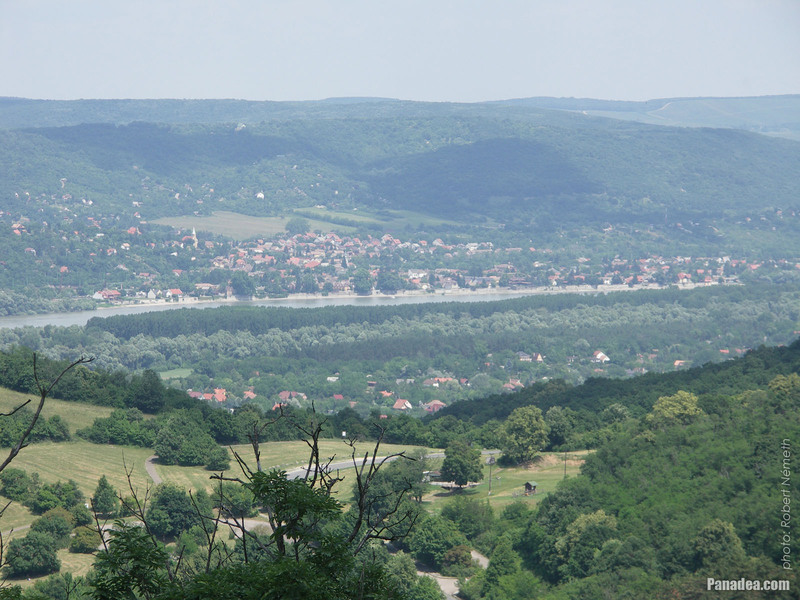 But despite it the Czechoslovak leaders have unilaterally decided to build the C version of the waterworks anyway. 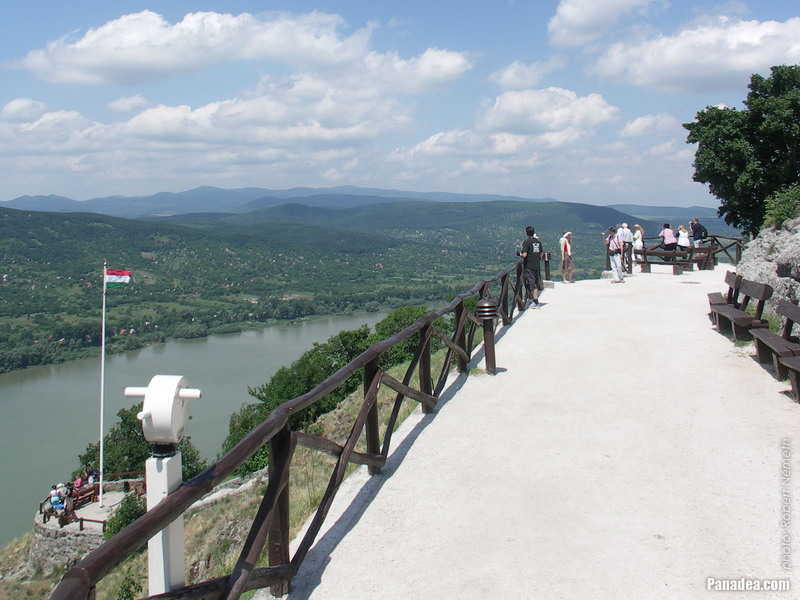 In 1992 they turned on the power plant (the Gabčíkovo Dam) and on a 40-kilometer-long section they arbitrarily diverted the water of River Danube to the Czechoslovakian side of the border. 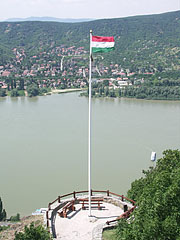 In response the government of Hungary took the dispute to the International Court of Justice in The Hague. 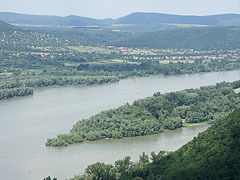 After five years the International Court decided that both parties were blamed equally: Hungary wrongfully terminated the interstate contract that was conclude in 1977, as well as Slovakia (that was already separated from the Czech Republic) unlawfully launched the Gabčíkovo power plant. 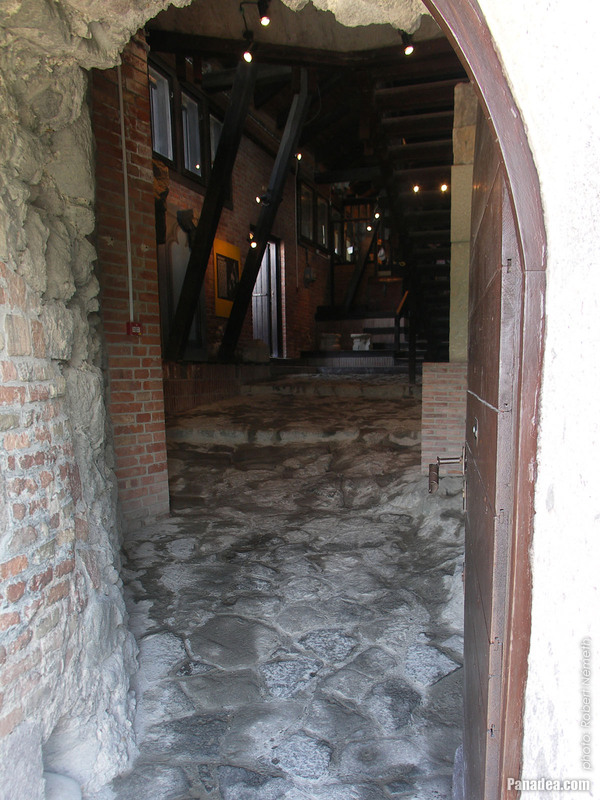 Anyway, some of the the disputes related to the project still have not been fully concluded. 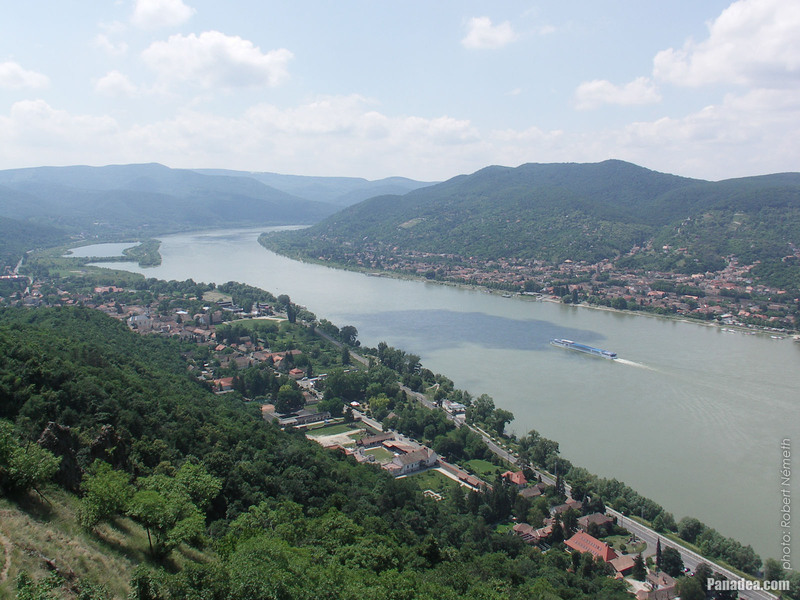 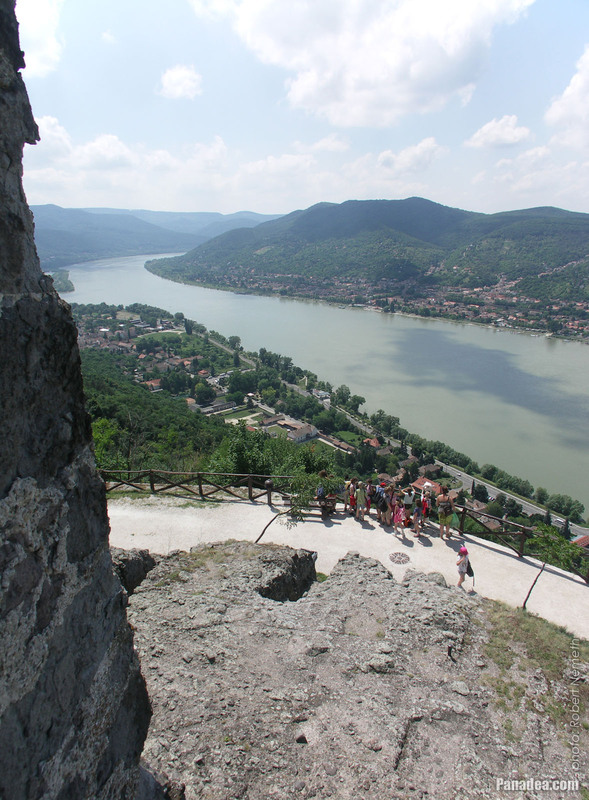 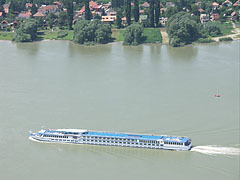 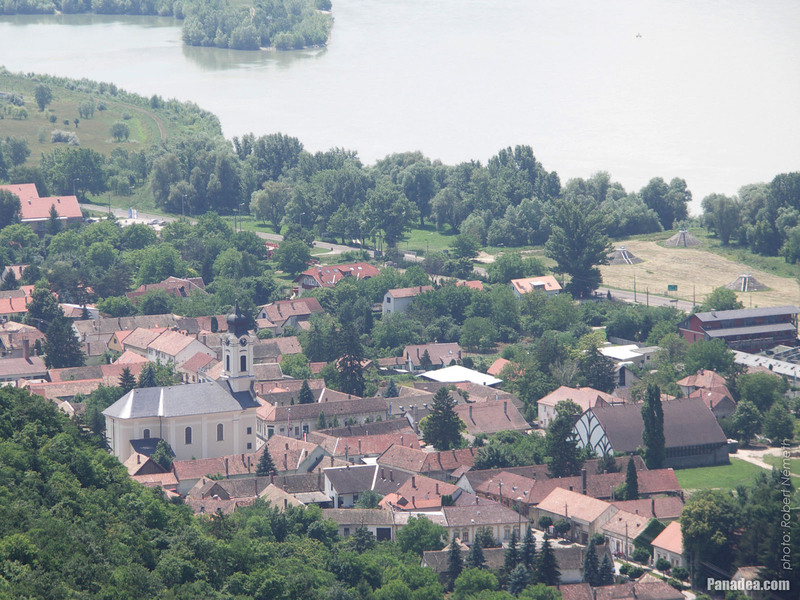 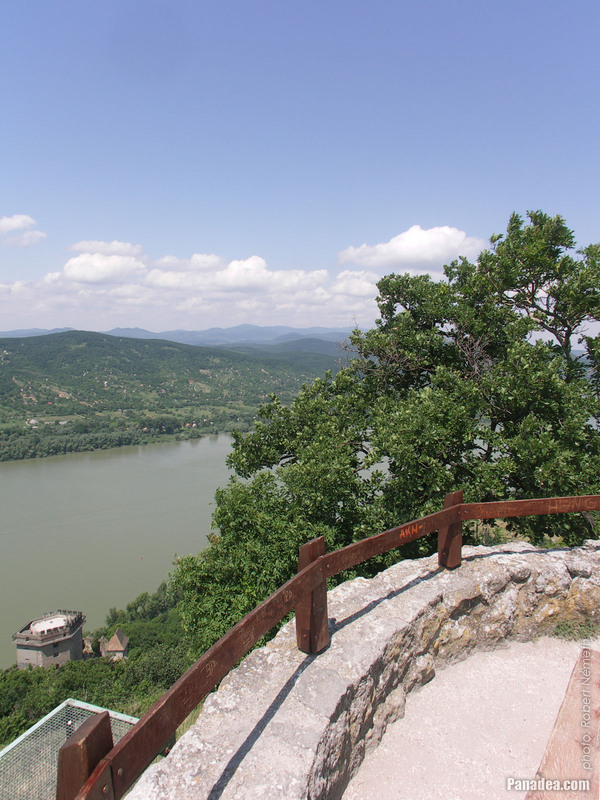 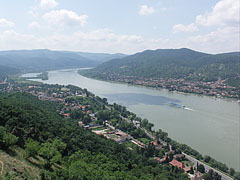 Slovakia diverts the water of River Danube still without a legal basis, as well as the project still has adverse environmental effects even today. The six-story Solomon Tower (in Hungarian "Salamon-torony") was a keep (fortified residental tower) in the Lower Castle of Visegrád. Its name is based on a misunderstanding, because King Solomon of Hungary from the Árpád dynasty who the tower is named after lived in the 11th century, so of course he couldn't be a prisoner in this 13th-century tower as the legend says. 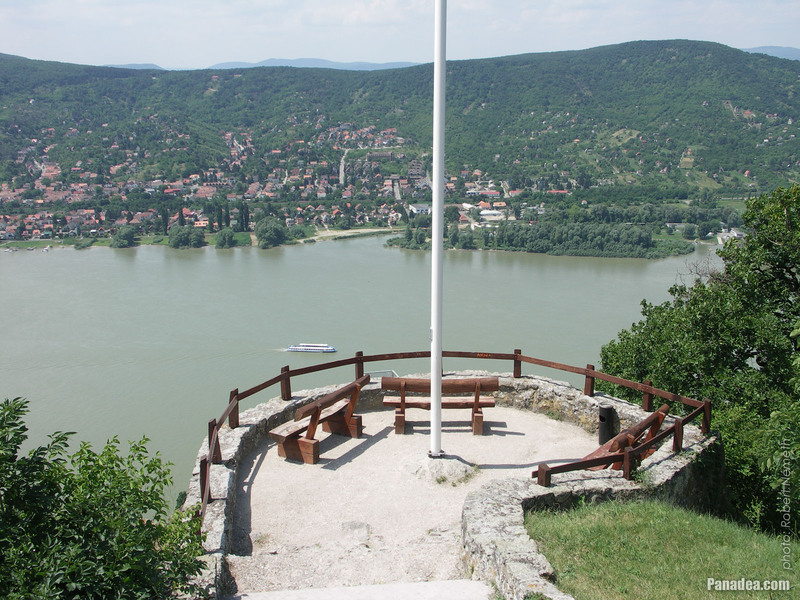 Solomon was a rebel and he wanted to regain his earlier throne from King (St.) Ladislaus I of Hungary, who finally had him caught in 1083. 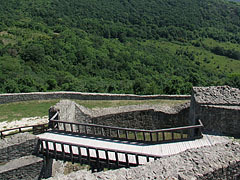 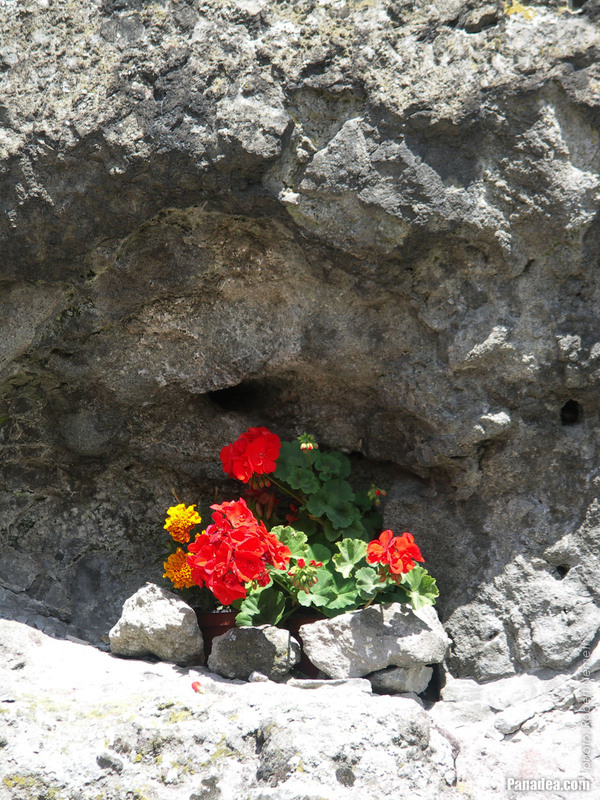 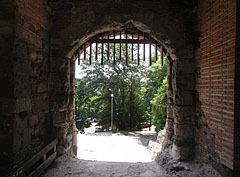 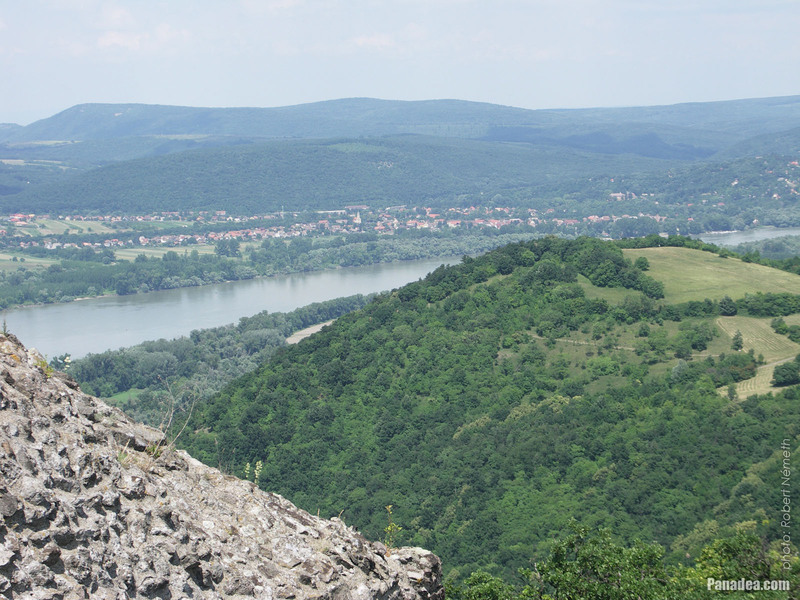 He was detained really in Visegrád, although not here but in the former Count's Castle (or Ispán's Castle) on the Sibrik Hill. 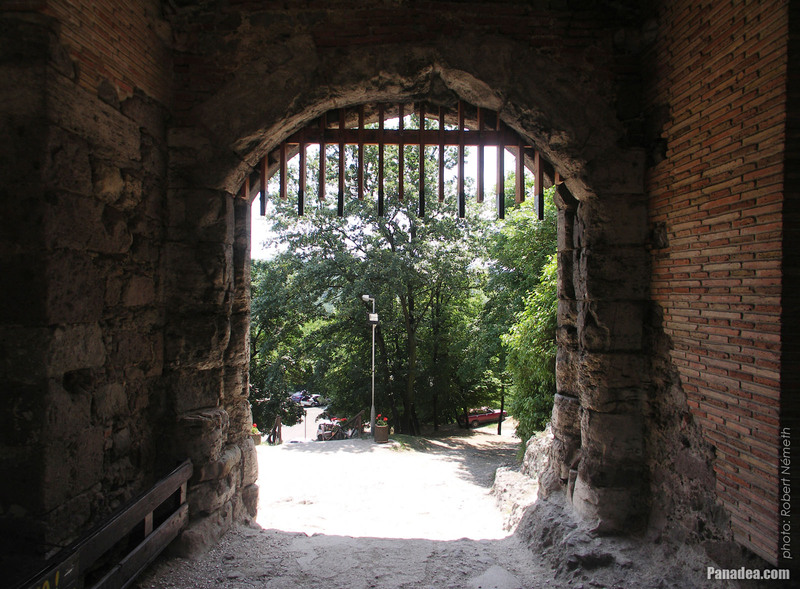 Moreover, King Ladislaus I soon released Solomon from the captivity, in August of the same year on the occasion of the feast of canonization of King Stephen I of Hungary. 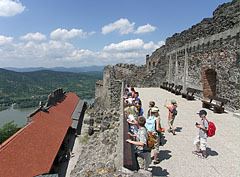 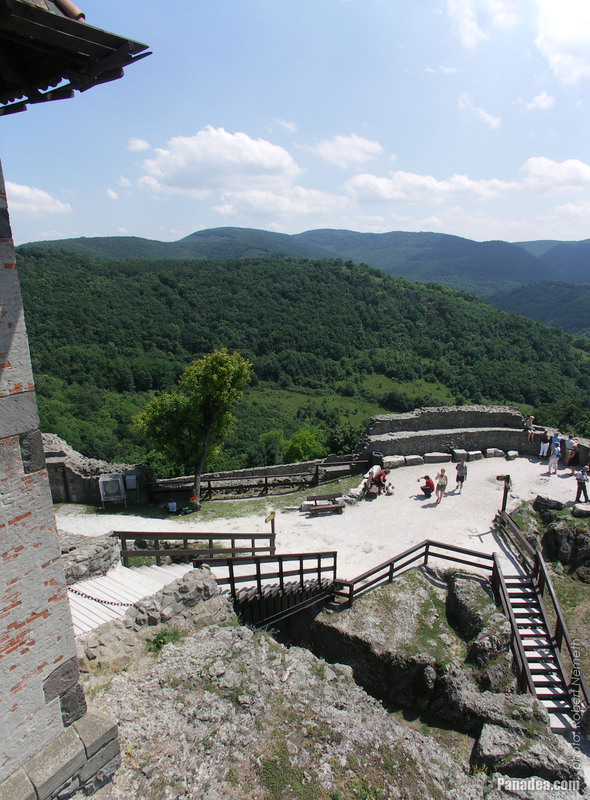 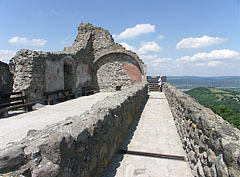 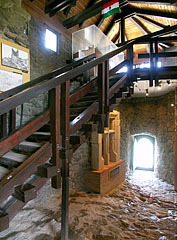 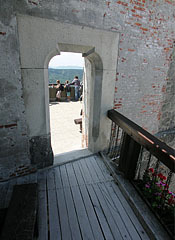 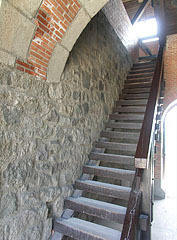 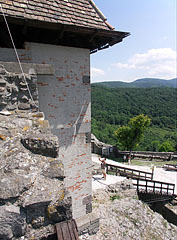 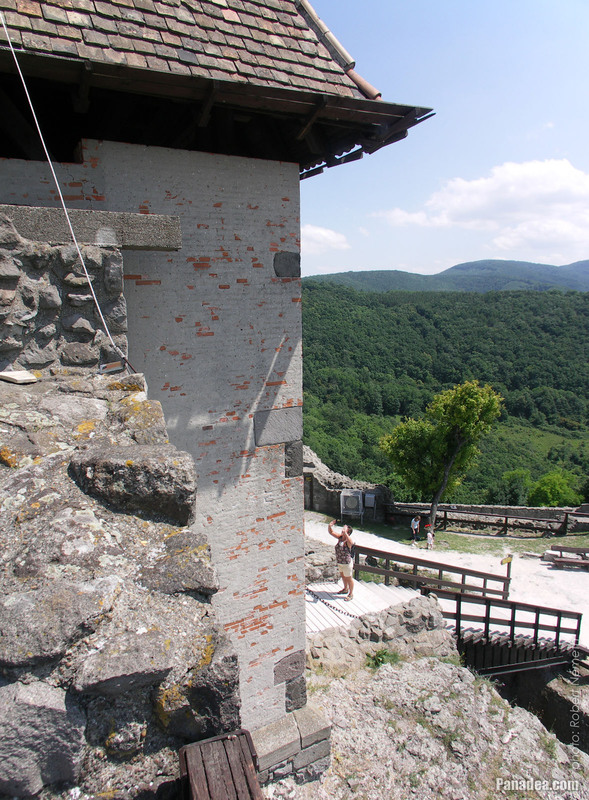 The specialities of the Solomon Tower are among others: the hexagonal shape which is unique in Europe, the 8-meter-thick walls, as well as the many survived romanesque style arched windows. The renovations were begun in the 1870s by the plans of Frigyes Schulek, who was also the architect of the Fisherman's Bastion ("Halászbástya"), as well as he designed the reconstruction of the Matthias Church ("Mátyás-templom"), both are situated in Budapest. 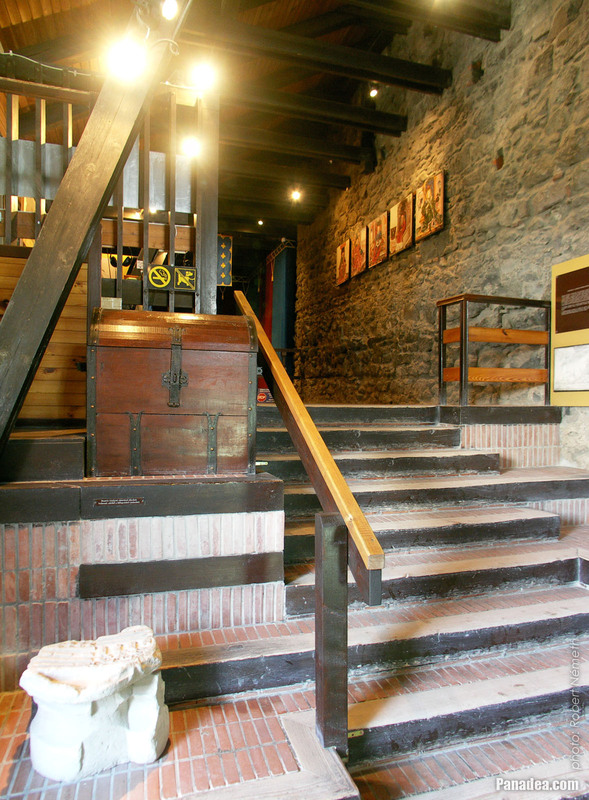 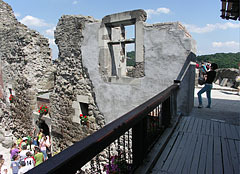 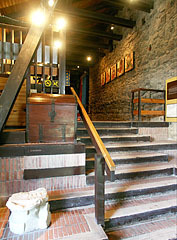 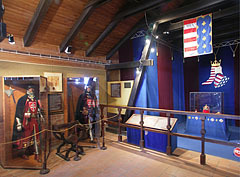 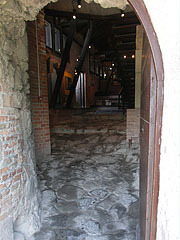 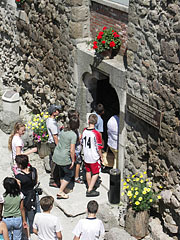 Today there is a local history exhibition within the walls of the renovated 31-meter-tall building. 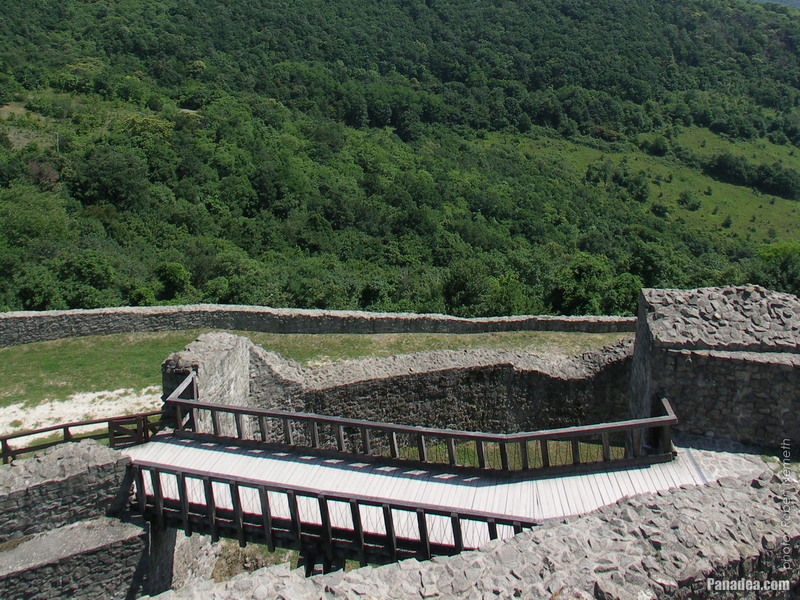 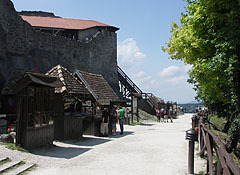 In 1335 the Visegrád Castle was the location of a famous summit meeting of kings, the event is called (the first) "Kings' Congress of Visegrád". 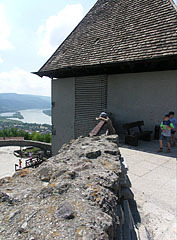 Beside the host King Charles Robert (Charles I of Hungary) the appointment was attended by among others King John I of Bohemia (John the Blind), King Casimir III of Poland, Wenceslaus Margrave of Moravia (the later Charles IV, Holy Roman Emperor), Henry XIV Duke of Bavaria from the House of Wittelsbach, and Rudolf I Duke of Saxony (Duke of Saxe-Wittenberg). 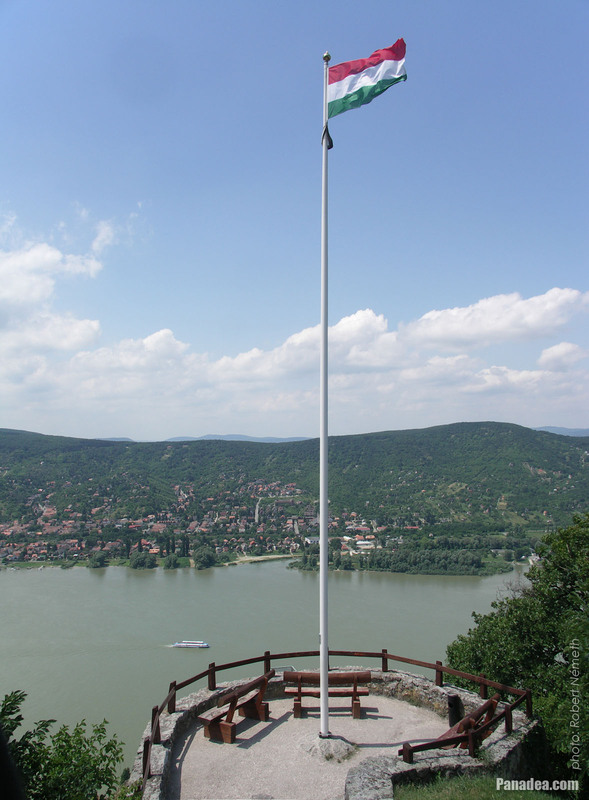 The meeting resulted in an agreement which ensured economic independence for the related countries from Vienna and the Habsburgs. 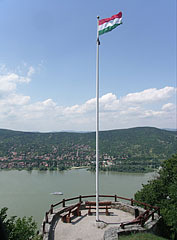 Following the example of the former congress in 1991 there was a cooperation summit meeting of the so-called "Visegrád Group" or "V4 Group" countries (Hungary, Poland and Czechoslovakia, the latter was separated into the sovereign Czech Republic and Slovakia in 1993) in the Royal Palace of Visegrád. 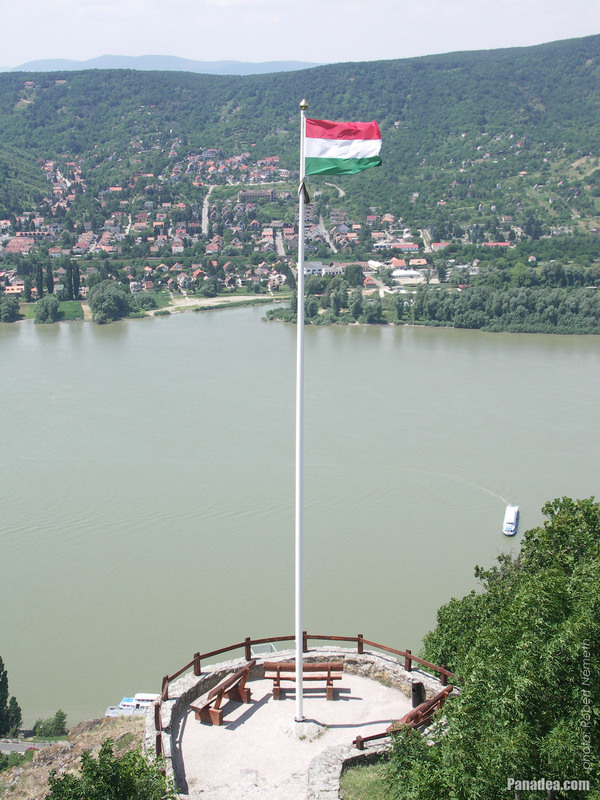 In 2006 on the occasion of the 15th anniversary of this event the prime ministers of the V4 countries together celebrated the success of the convention in Visegrád. 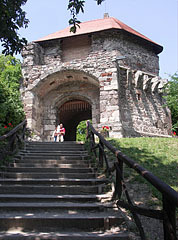 In 1370 a Polish delegation arrived into the town and they offered the Crown of Poland to King Louis the Great (Louis I of Hungary). After a coronation ceremony the Polish crown was kept together with the Holy Crown of Hungary in the treasure chamber of the Upper Castle of Visegrád. 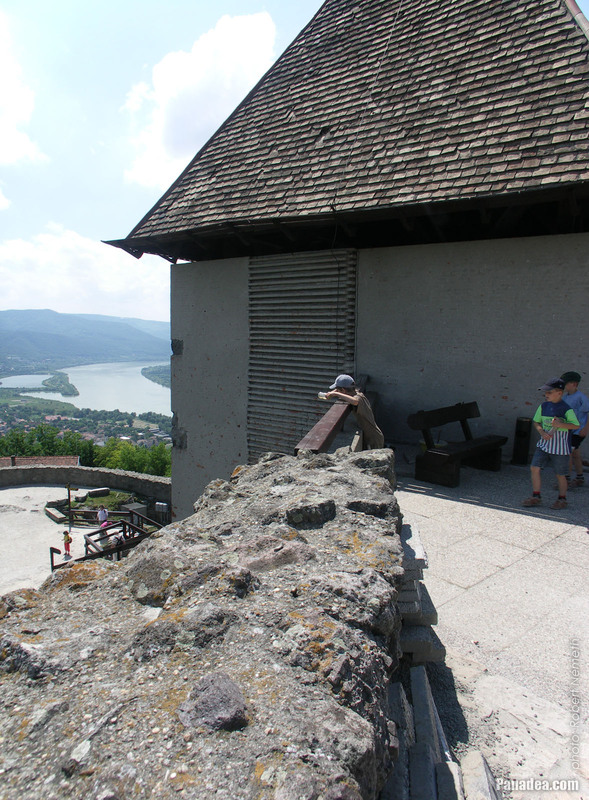 With some minor interruptions Visegrád was the depository of the crown jewels including the Holy Crown, from 1301, the beginning of the era of King Charles Robert (Charles I of Hungary) until 1529. 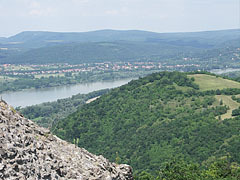 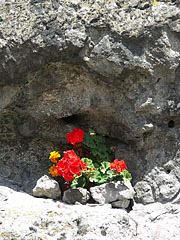 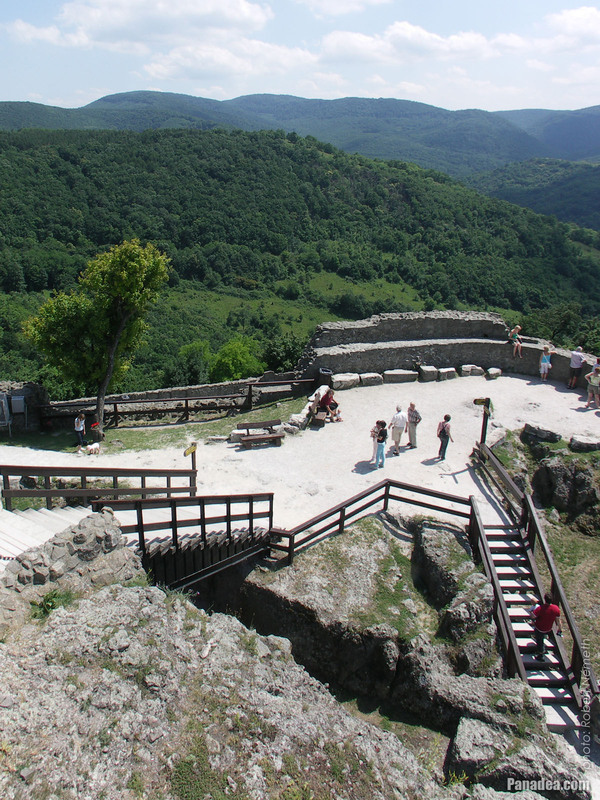 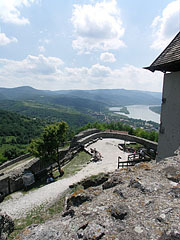 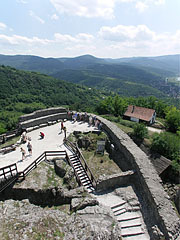 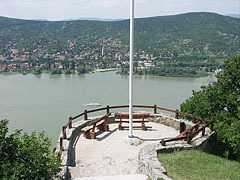 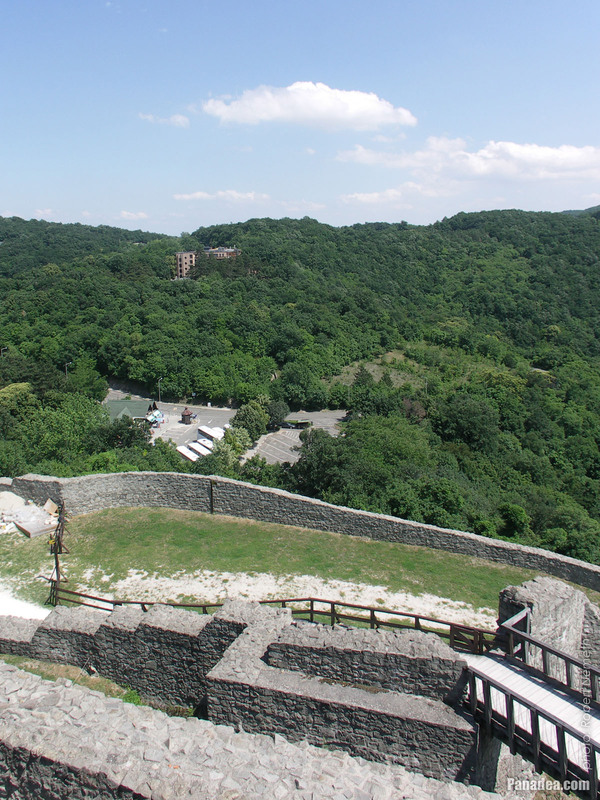 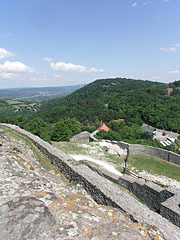 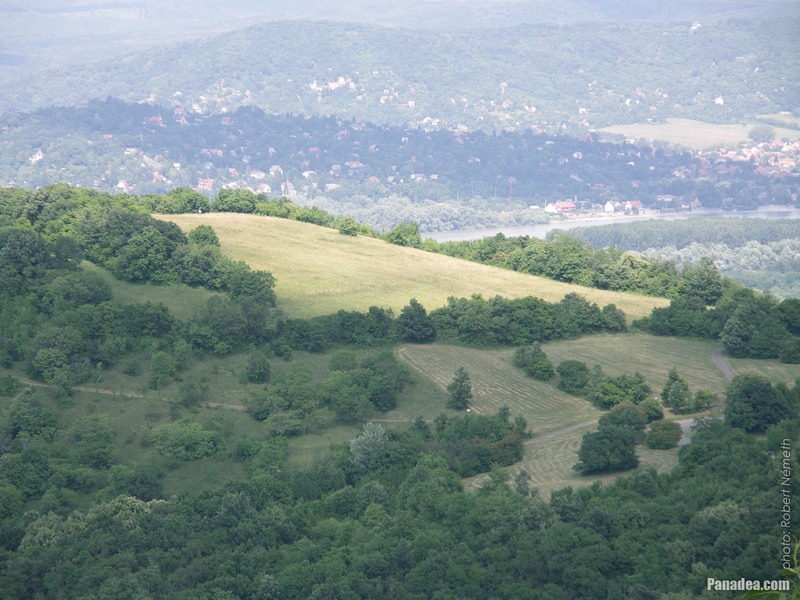 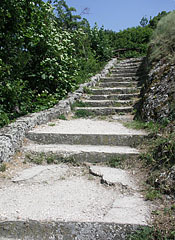 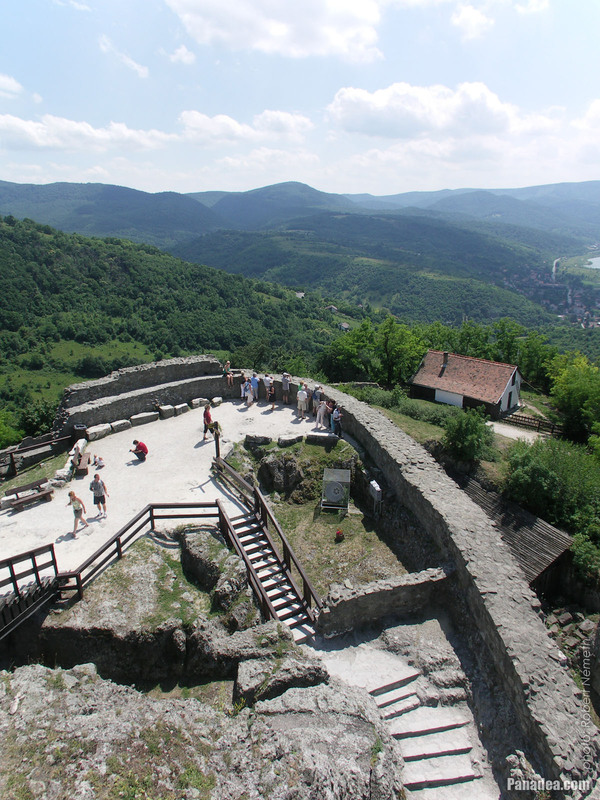 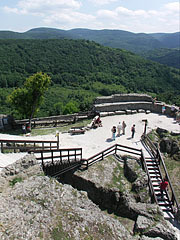 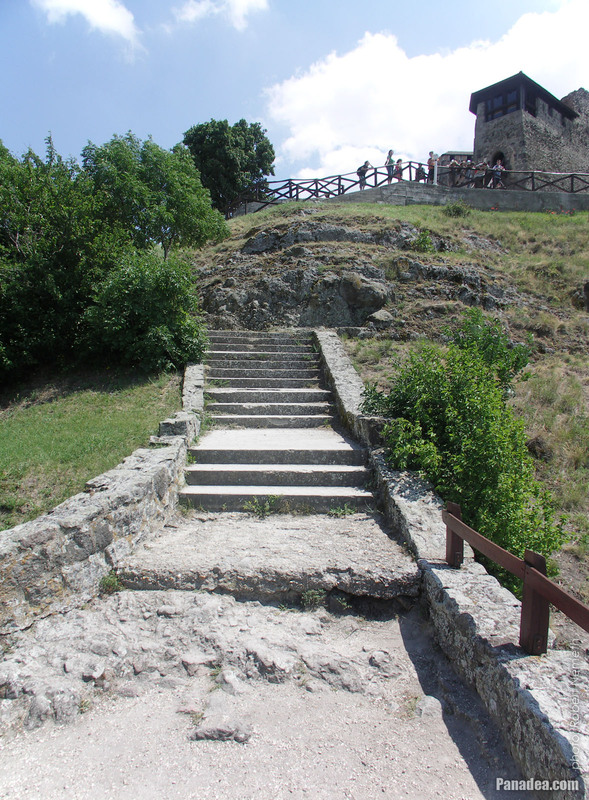 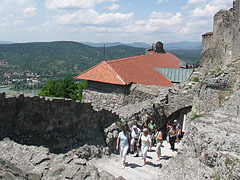 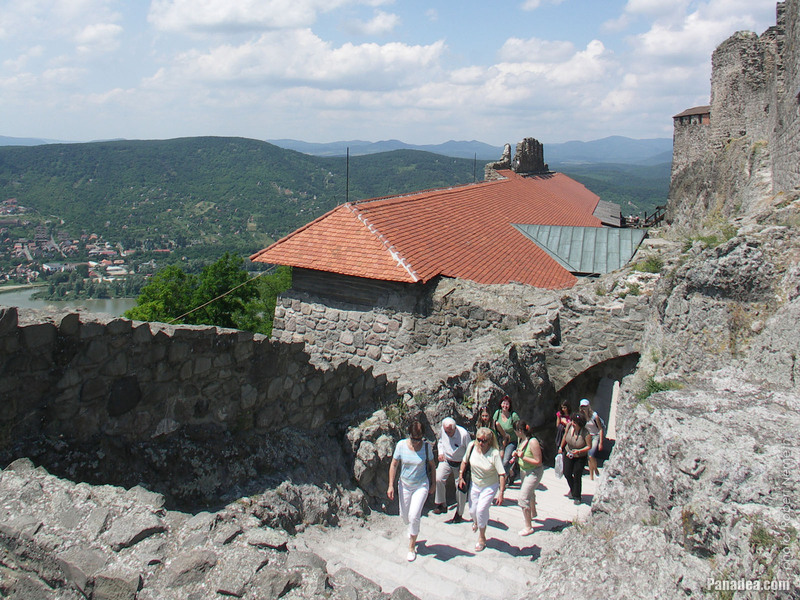 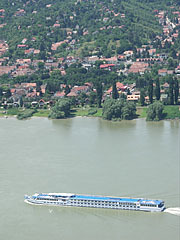 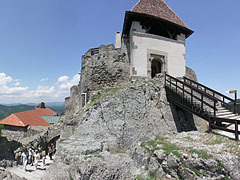 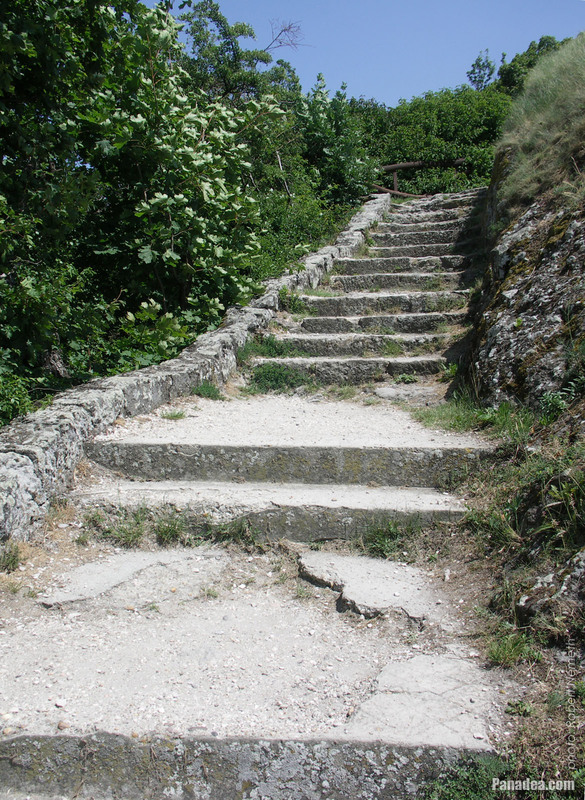 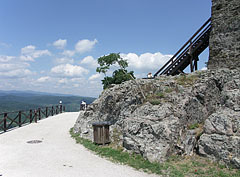 The 377-meter-high Nagy-Villám Hill (literally "Great Lightning Hill") is situated near the Várhegy or Castle Hill in Visegrád. 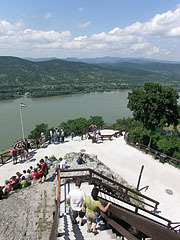 On the top of the hill it is the Zsitvay Lookout Tower, which was built in 1933 for the 20th anniversary of the foundation of the Hungarian Tourist Association ("Magyar Turista Szövetség"), ordered and financially supported by Tibor Zsitvay, who was the Minister of Justice at that time and also the chairman of the tourist association. 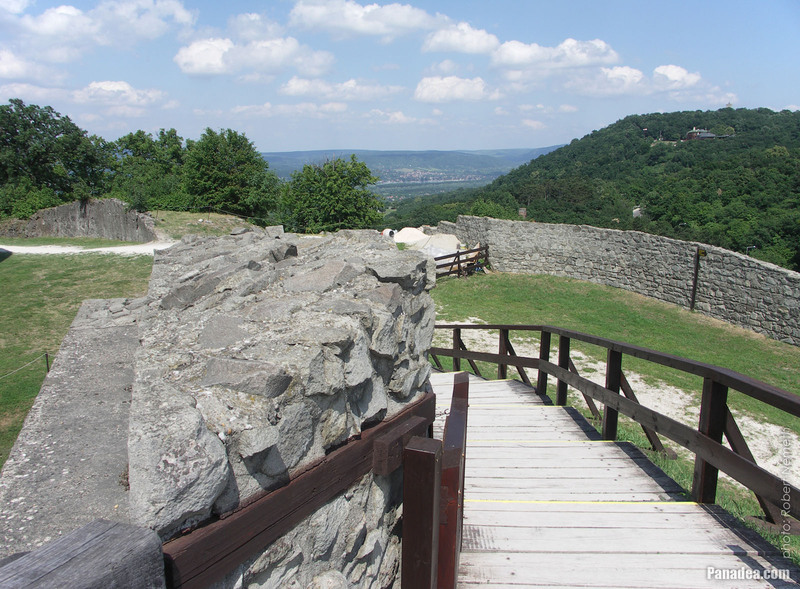 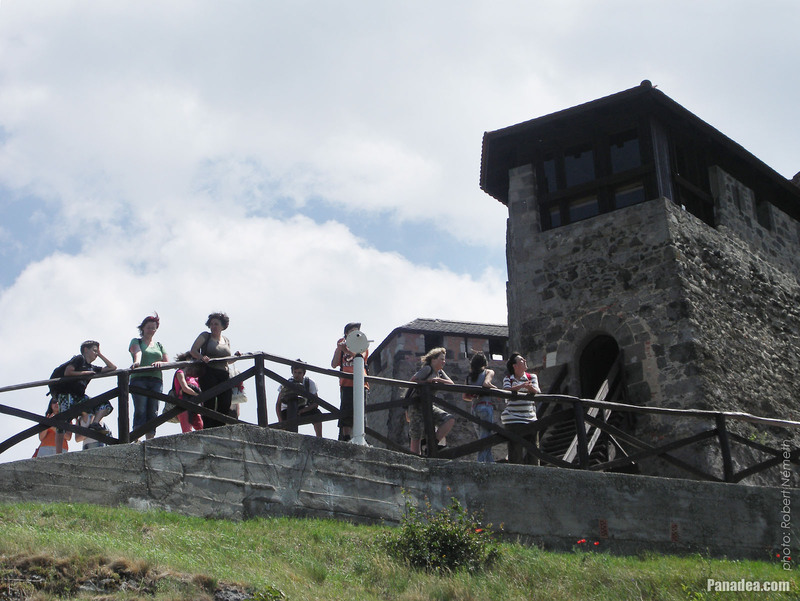 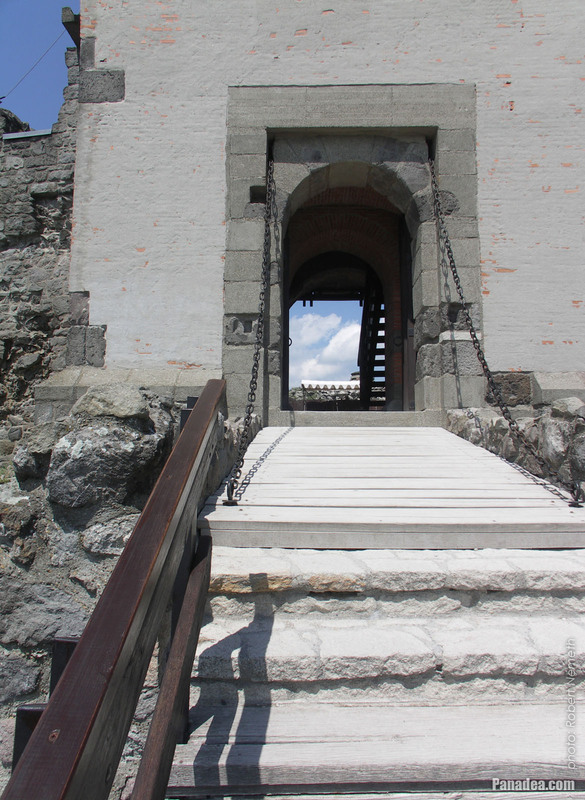 The stone building was designed by dr. Hubert Kessler architect, initially it was named Jubilee Lookout ("Jubileumi-kilátó") but quite soon (already in 1935) everybody started to call it Zsitvay Lookout ("Zsitvay-kilátó"). 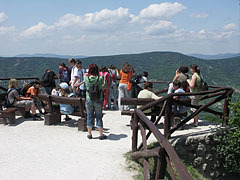 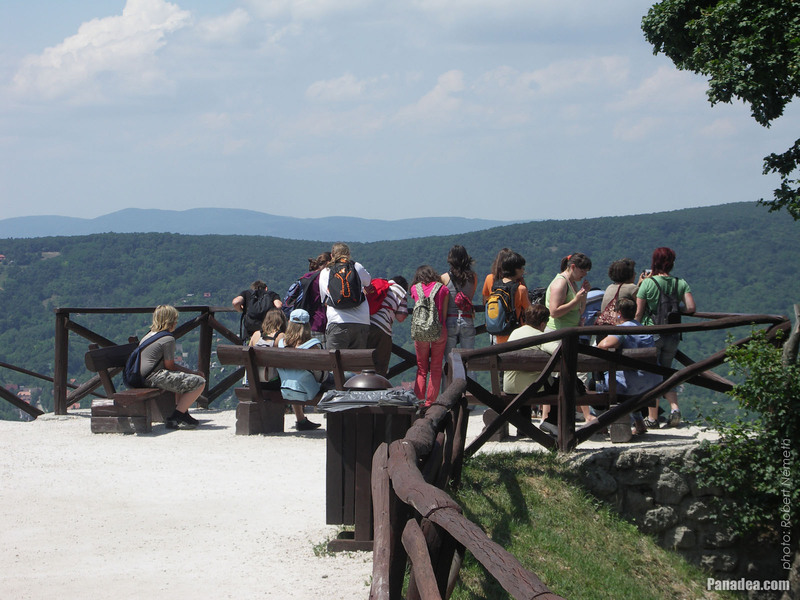 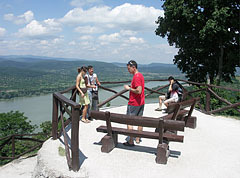 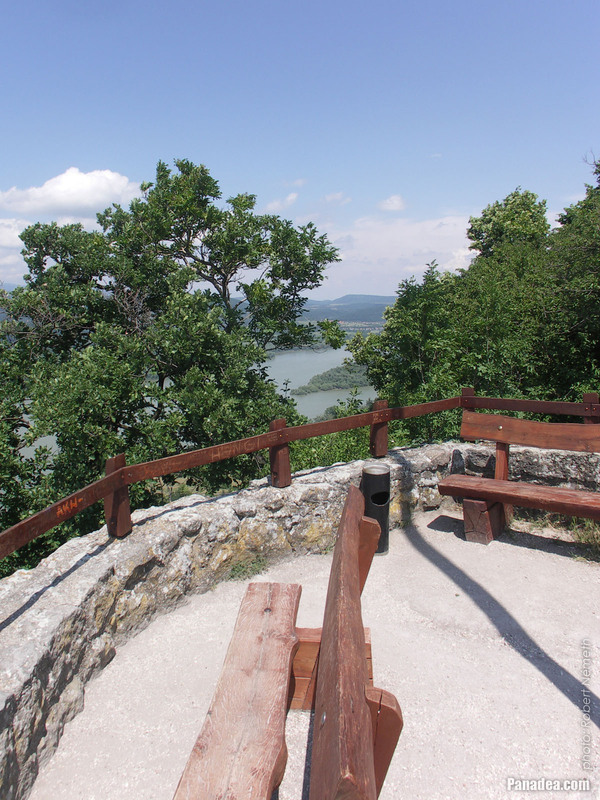 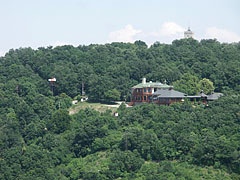 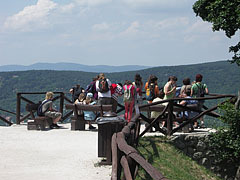 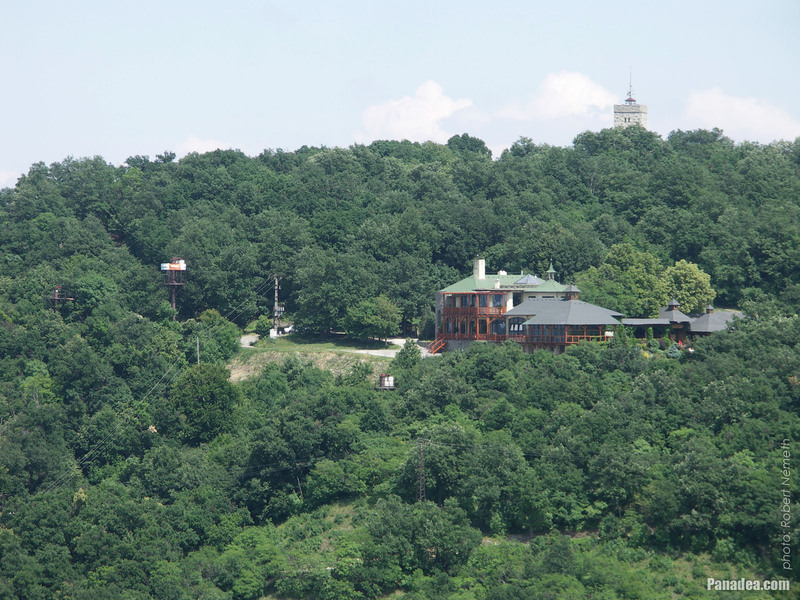 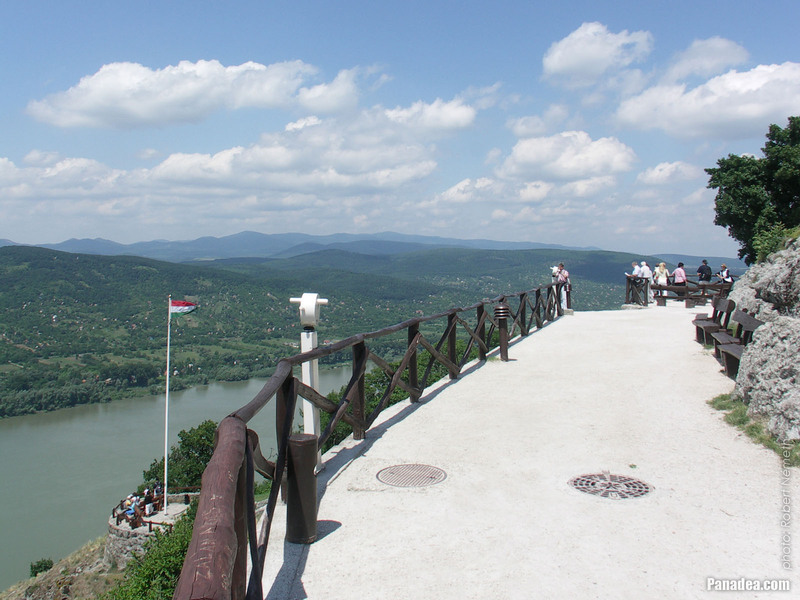 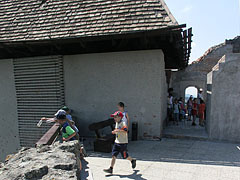 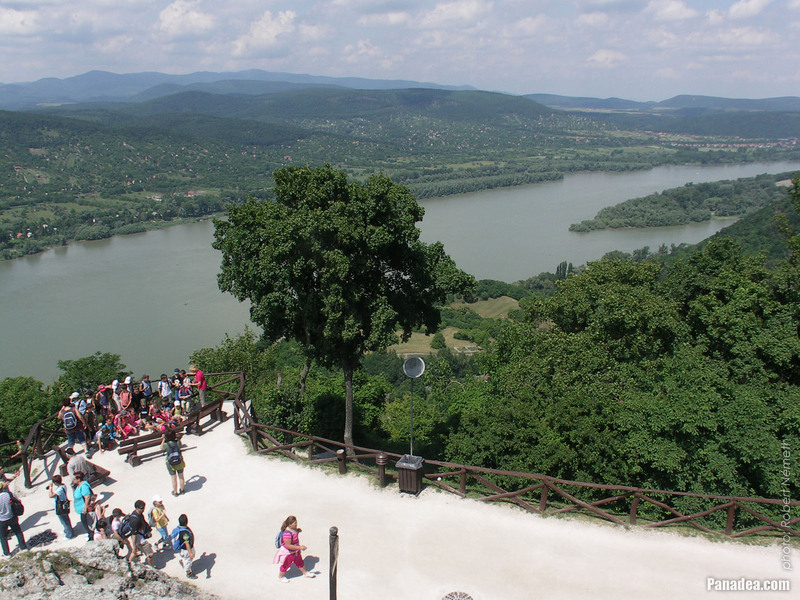 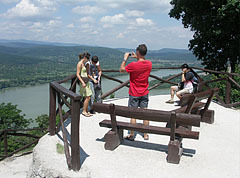 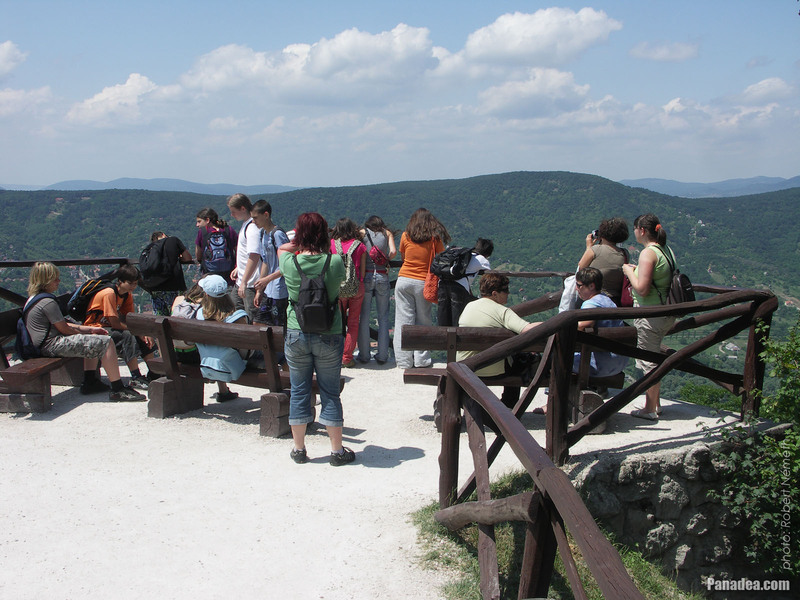 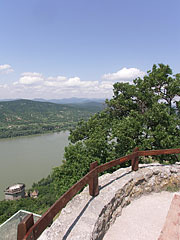 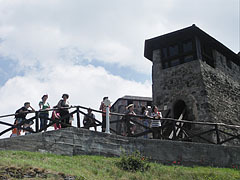 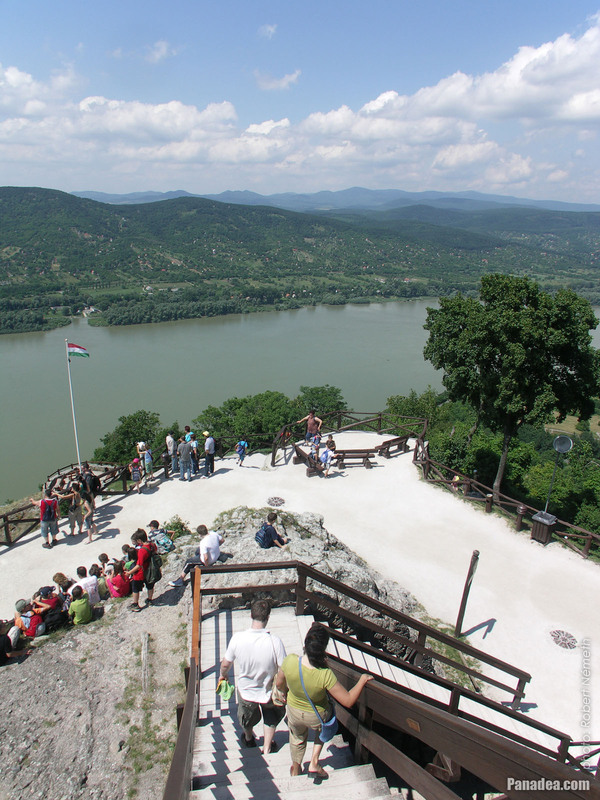 Beside the lookout tower among other things the Nagyvillám Restaurant, an adventure playground and a canopy cableway can be found on the Nagy-Villám Hill.